Jan. 1: NASA's GRAIL B spacecraft enters lunar orbit. Jan. 15: A stranded Phobos-Grunt spacecraft reenters the Earth atmosphere. Jan. 27: An 11-meter asteroid 2012 BX34 passes within 60,000 kilometers from Earth. April 4: The Antei-2500 system successfully intercepts a target cruise missile during test in Kapustin Yar. May 9: The Missile Defense Agency, MDA, and a US Navy ship Lake Erie (CG 70) successfully conducted a flight test of the Aegis Ballistic Missile Defense, BMD, system, resulting in the first intercept of a short-range ballistic missile target over the Pacific Ocean by the Navy’s newest Missile Defense interceptor, the Standard Missile-3, SM-3, Block 1B. 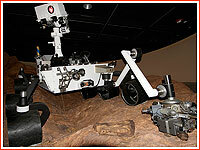 Aug. 6, 05:31 GMT: NASA's Curiosity rover lands inside Gale crater on Mars. Oct. 16, 12:01 Moscow Time: The 53T6 missile-interceptor from the A-135 system flies a successful test mission from the Sary Shagan site. Dec. 13, 16:30:09 Beijing Time: China's Chang'e-2 probe flew as close as 3.2 kilometers from asteroid Toutatis. Dec. 17: A pair of Grail, Gravity Recovery and Internal Laboratory, spacecraft slammed into a two-kilometer-high mountain on the far side of the Moon near the north pole. By mid-2012: According to original plans Ariane-5 or Soyuz-ST rocket were to launch the 2,900-kilogram Arsat-1 communications satellite for Empresa Argentina de Soluciones Satelitales Sociedad Anonima from Kourou. Arianespace announced the launch contract on June 28, 2010. Arsat-1 will be equipped with twelve 36 MHz, eight 54 MHz and four 72 MHz transponders, all in Ku band. It will offer a wide range of telecommunications, data transmission, telephone and television services mainly across all of Argentina, Chile, Uruguay and Paraguay. The satellite is being built by the Argentine company INVAP, with Astrium and Thales Alenia Space as leading equipment suppliers. Before the end of 2012, the satellite was assigned to fly on Ariane-5 in the middle of 2013. June: An AzerSat communications satellite to be launched on Proton, Zenit or Ariane-5 rocket for the government of Azerbaijan. 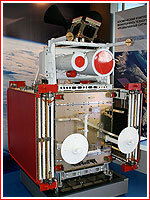 The spacecraft is to be built by Orbital Sciences Corp. (As of February 2010. The launch was originally planned for December 2011.) Before the end of 2012, the satellite was assigned to fly on Ariane-5 in January-February 2013. Late 2012: Europe's Ariane-5 or Soyuz-2 rocket to launch Mexsat-3 communictions satellite from Kourou for Mexican government’s communications and transport administration, Secretara de Comunicaciones y Transportes. Mexsat 3 will be built by U.S. satellite manufacturer Orbital Sciences Corporation. With a mass at liftoff of nearly 3,050 kg, it will carry extended C-band and Ku-band transponders. The satellite will provide next generation communications services throughout the country from its 114.9 degree West longitude orbital slot. Mexsat 3 will have an in-orbit lifetime of over 15 years. 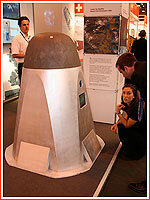 Arianespace announced that it won a contract to launch Mexsat 3 on Sept. 29, 2011. Before November 2012, the satellite was assigned to fly on Ariane-5 rocket in December 2012. Second quarter: Ariane 5 or a Soyuz-ST to launch VINASAT-2, for Vietnam Posts and Telecommunications Group (VNPT) from Kourou. A launch contract with the satellite developer -- Lockheed Martin Commercial Space Systems (LMCSS) -- was announced on June 14, 2010. By May 2012, VINASAT-2 was assigned to Ariane-5 with a projected launch date on May 15, 2012. A Russian submarine-launched rocket was originally expected to lift an EXPERT reentry demonstrator for the European Space Agency in October 2010. However during 2010, the mission was delayed to the summer of 2011 and by mid-2011 slipped to spring 2012. According to ESA, in 2012, funding was provided by the ESA General Studies Programme (GSP) to support Thales Alenia Space Italy in carrying out analyses to identify an alternative launch system. The availability of alternative launch systems on the Russian side appears doubtful because of the evolution of the Russian Ministry of Defence policy not to use military systems for civil space missions. A Technical Assistance Agreement to evaluate Expert launch options with US industry and NASA was approved by the US Department of State. Technical discussions with Orbital Sciences for the evaluation of alternative launch vehicles have started. 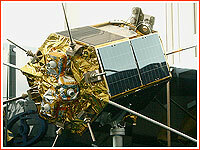 The mission was later re-assigned to the European Vega launcher. Mid 2012: Arianespace was to launch the OHO-1 communications satellite for a new satellite services operator OverHorizon onboard either Ariane-5 or Soyuz rocket from Kourou. OHO-1 was to be produced jointly by Orbital Sciences Corporation and Thales Alenia Space. Orbital was expected to supply the Star 2.3 satellite bus, which would have a liftoff mass of approximately 3,200 kilograms with its payload provided by Thales Alenia Space. The launch contract for the mission was signed on March 18, 2010, however the mission was canceled sometimes before September 2012. Delayed from early 2011: A Proton M with Briz M upper stage to launch the EuropaSat communications satellite for Inmarsat. Thales Alenia Space of France is developing satellite, using its Spacebus 4000C3 platform. The spacecraft working in S-band mode will provide mobile broadcast and two-way telecommunications services throughout Europe. The spacecraft will have a mass of about 5,700 kilograms. (The contract for the mission was announced on August 22, 2008.) Before November 2012, Inmarsat first delayed and then canceled the EuropaSat project replacing it with three launches of Proton for the Global Express program. 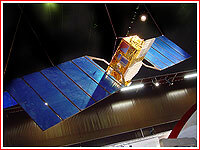 Postponed from December 2010: A Proton to launch SkyTerra 2 comsat from Baikonur. The spacecraft was built by Boeing for SkyTerra LLC. The contract was later terminated. As a small consolation for the failure of Phobos-Grunt, NASA successfully launched its Mars Science Laboratory, MSL, carrying a Russian-built instrument. Copyright © 2012 Anatoly Zak.